This is Vader. Or was Vader. He passed away of old age a few weeks ago. Kept by C.J. Carman and Johnathan Ferris of the Wildlife Center snake rescue crew, Vader was an African puff adder (Bitis arietans) rescued from a private collection. 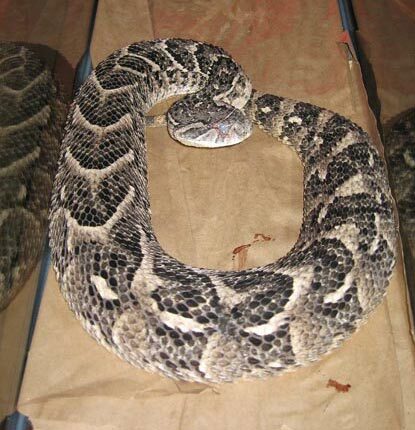 When Vader passed away, he was a snake that weighed in excess of 70 pounds. Vader was named such because when you walked into the room he was kept in, the hissing sounds he made sounded just like Darth Vader's breathing noises from the Star Wars movies. His bite could deliver so much venom (through 2 inch-long fangs) that your only chance for survival would require you to amputate whichever part of your body that took the strike. Either that or you had better be somewhere near Phoenix, Arizona, because that's the only place where you can obtain the anti-venin for this monster. I was more impressed with Vader than any other snake I've ever encountered, and more impressed with C.J., Johnathan and Tom Wyant than any other snake people I've ever met. I'm thrilled each time I get to go herping with them. It's like being a Lakers fan and getting to play with Kobe. Scariest video on all of the internet! You should upload some videos of snakes to VEOH.com .